While reading thru articles on toddler development on the Parenting magazine website, I came across this topic "Teach Your Child to Use Chopsticks"
Koreans consider it uncultured and rude to eat rice with chopsticks by picking up the rice bowl and bringing it closer to one's mouth. 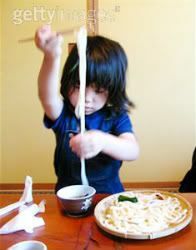 Dishes are to be left on the table and a spoon and chopsticks used accordingly. When laying chopsticks down on the table next to a spoon, one must never put the chopsticks to the left of the spoon. Chopsticks are only laid to the left for deceased family members. I've never really been a fan of Thanksgiving along with the major other holidays. It's weird to me that people celebrate something based on misconstrued history. We all know what happened to the Native American Indians after they saved the lives of the pilgrims. I guess some people just over look that little fact and claim this holiday as a time to be thankful for things in their lives. Well I was never one to over look little facts. As usual I side with the Native Americans this Thanksgiving as I've done in the past. I refuse to celebrate this "holiday" and what society "suggests" I should be doing around this time. This year I'm very concerned about trying to raise a socially aware child. I want Daniel to know and honor all people and their cultures. So I started researching online what I can do with him since this month is National American Indian and Alaska Native Heritage Month. The exhibition IndiVisible: African-Native American Lives in the Americas is a collaboration between the Smithsonian’s National Museum of the American Indian, National Museum of African American History and Culture, and the Smithsonian Institution Travelling Exhibition Service (SITES). African and Native peoples came together in the Americas. 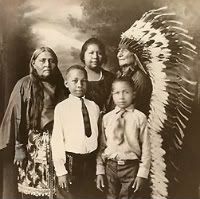 Over centuries, African Americans and Native Americans created shared histories, communities, families, and ways of life. Prejudice, laws, and twists of history have often divided them from others, yet African-Native American people were united in the struggle against slavery and dispossession, and then for self-determination and freedom. 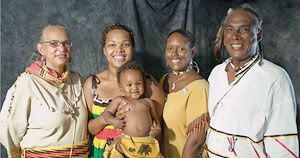 For African-Native Americans, their double heritage is truly indivisible. You can check the exhibit tour schedule to find out when it will be in your area. Since I can't travel to the DC exhibit I'm going to visit the The National Museum of the American Indian here in NYC with my son this month and see what cool activities they have. 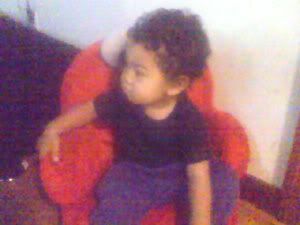 Daniel loves this Elmo chair. He sits in it to watch TV and hangout. A few weeks ago I took myself out on a date. I planned on having some wine, hearing great music then mixing and mingling with other adults who also came out in support of Loving Day, a global network that fights racial prejudice through education and builds multicultural community. 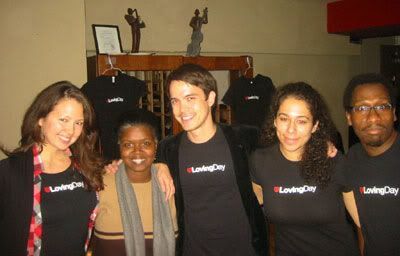 That night I attended Loving Day's Benefit Concert 2009. Now that alone is a good reason to go hangout with the Loving Day crew but after all the drama in the news about the interracial couple denied a marriage license ...well I wanted to be with my community. At times like that when a basic social right...to get married...can be denied because of a person racial background the world can be a scary place. If the right to get married can be denied then what next? 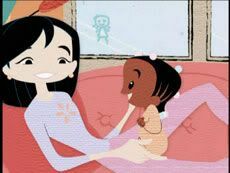 The right for a mother to bear a biracial child? It's not that far a jump. Bardwell said he's not a racist, he came to the conclusion that most of black society does not readily accept offspring of such relationships, and neither does white society, he said. As a black mother of a biracial child these kinds of comments worry me. We're living in a time where a biracial /half black child has become president but yet some people still think half black children will suffer in life. It tiring to fight against beliefs like that alone. 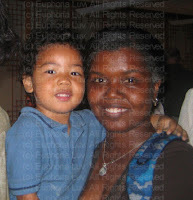 Organizations like Loving Day, Swirl , Mavin and other are key as faces of the multiracial community on a large scale. I worry that without them the fight to live in this world would be so much hardier. I'm grateful to know them and to know that they stand with me to keep spreading awareness for all the different multiracial communities. It starts with a woman and child sleeping. Then the child wakes up and starts to draw pictures on the fogged up window. She then wakes up the woman who also draws on the window. The scene ends with a drawing of women and child holding hands drawn on the window while they cuddle. Just regular Sesame Street family stuff right? 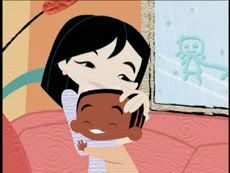 Except this family is a Asian women with a black daughter! Having trouble finding childcare? As busy parents sometime we need a little help going thru this difficult task. A few months back I was invited to review Care4Hire.com. At the time I was too busy juggling life as a return to work mom. But I kept having childcare issues on and off for months. I'd respond to and place online ads and then interview many babysitters. But still ended up frustared. It was alot of work for little results. I decided maybe the Care4Hire service would get me better results. Setting up an account was simple and straight forward. They have 3 levels of membership to chose from including a FREE membership for 14 days. Then you set up your profile and describe your family and the kind of care your seeking. Based on your basic profile you'll start to received emails from care providers. If you don't want care providers contacting you then you can make your profile private and do your own search. There is also an option for special advertising for any family that needs extra help find the right caregiver. Care4hire will not charge extra for that service. Many things impressed me on the Care4hire site least of which is their CareMatch. In CareMatch you can set up a search for caregivers based on different requirements like price per hour, location, language and special needs (twins/disabilities/etc). Care4Hire Sample Interview Questions, Contract and Reference Check questions is a good thing to have already on site for some parents. Some of us don't know the key questions to ask a caregiver much less have a employment contract. Caregivers can have their references and background check available for your viewing. Love that! Saves so much time and makes it easy when sorting thru caregivers to find the right one. Having the care providers contact me directly with their profiles was nice. Having to go thru 2 extra steps of clicking on their member id to see their profile, photo, background qualification, and contact info wasn't nice. When you have over 90 emails to check, it would be a time saver to view all you need on one screen or have a preview of key info. Having a way to sort caregiver based on location would also be helpful. Even though I said I was looking for someone in the brooklyn area, after checking thru profiles I saw responses from caregivers in outer boroughs. While I didn't follow thru and directly contact any of the caregivers...I recently was accepted in a neighborhood daycare...The service of Care4hire is very useful and I would definitely use them if I run into childcare issue again. Disclosure: My free membership was upgraded for the purpose of reviewing this site. No other compensation was received. This review is based on my experience while using this site.